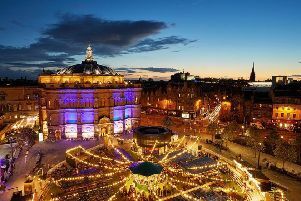 Edinburgh International Festival: Martin Creed’s artworks – not least his Turner Prize-winning installation the lights going on and off (as they surely did) – have intrigued and bemused people in equal measure. It seems entirely possible that his late night EIF residency, the equally accurately described Words and Music, could elicit the same response. But then Creed himself comes across as somewhat bemused and words are his way of making sense of feelings. Words and Music complicates things a bit for Creed but does make for a more entertaining show for the audience. There is a punk purity to his playing, usually curt chords on a chiming 12-string guitar, and his rudimentary, repetitive lyrics delivered in a naïve whiny tone. If this doesn’t sound like much of a performance, don’t worry – there is much sharp, witty and whimsical food for thought in his seemingly haphazard method, ranging from his resolutely non-muso analysis of the relationship between words and music, the defined and the abstract, to the companion pieces, Let Them In and Border Control. The former is his lo-fi indie take on an ancient folk blues, while the latter is little more than a chant, which chops away at the title to the very last syllable. In Creed’s engaging world, less usually means more. Until 27 August. Today 10:30pm.